The reviewer obtained a copy of the book from her school library. As we near the end of 2011, it's time to reflect upon the year in books. Later this month we'll compile a list of our favorite nonfiction books of the year. 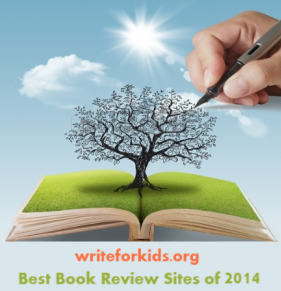 There is one nonfiction book in particular that we haven't featured yet on the blog. So, better late than never...we review Amelia Lost by Candace Fleming. If you poll middle grade readers about their favorite biography subjects you will undoubtedly hear Amelia Earhart's name mentioned again and again (along with Harry Houdini). We have a healthy collection (22 copies) of Amelia Earhart books in my library. These biographies span formats from graphic novel to picture book, and they circulate a lot. Why do kids enjoy reading about Amelia Earhart? I think they love the sense of adventure and the unsolved mystery. Over the years, some biographies have oversimplified the story of Earhart while others have perpetuated myths surrounding her life. Enter Candace Fleming. Fleming spent a great deal of time researching Amelia Earhart, and she provides an in-depth look at the life of the famous aviator: the good, the bad, and the fibs. Yes, Amelia Earhart told fibs. 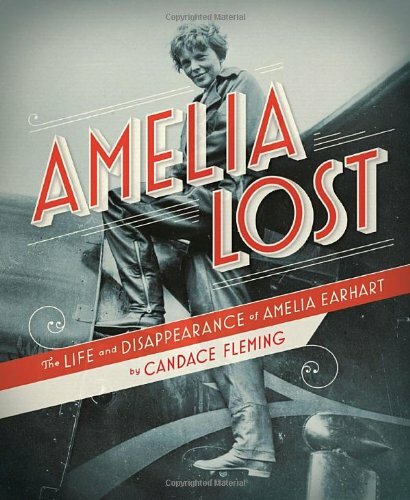 Upon reading the introduction, readers will discover that Amelia Lost is not the typical Earhart biography for kids. Fleming's impeccable research uncovers many truths that other Earhart bios have missed. Fleming pokes holes in the story Earhart told about seeing an airplane at the Iowa State Fair in 1908. The author investigated this claim, and it isn't true. While Earhart was an accomplished pilot, she was also clever at using the media to further her status and her celebrity. "In short she left behind layer and layer of myth and legend." The format of Amelia Lost is highly appealing to middle grade readers. Instead of a traditional, chronological biography, Fleming alternates between the story of Earhart's life and the story of her final flight. The first chapter begins with the ship, Itasca, attempting to communicate with Earhart's plane near Howland Island. Immediately, readers will wonder where Earhart could be. Fleming builds suspense then ends each chapter with a cliffhanger before shifting back to Earhart's life story. "Seconds turned to minutes. Minutes became an hour. But the sky above Howland Island remained empty. And in the radio room, Leo Bellarts and the other crew members sat listening to the "mournful sound of that static." Where, they wondered, was Amelia Earhart?" Fleming paints a portrait of a complex woman who worked hard and lived a full life despite the ups and downs of her childhood. Readers will empathize with young Amelia when her family loses their home, wealth and status due to her father's drinking problem. While visiting California, Earhart convinced female pilot, Neta Snook, to give her flying lessons. Earhart was determined to learn to fly even if it cost $1.00 per minute. Sometimes her passion for flying impeded her judgement. When first learning to fly, Earhart decided to fly to Long Beach without checking to make sure the plane had enough fuel. Luckily, Snook was there to take the wheel and bring the plan back to the landing strip at Kinner Field. Readers will root for Earhart as she attempts to fly across the Atlantic. I was surprised to learn that this was not technically a "solo flight." Veteran aviator, Bill Stultz, was on board the plane with Earhart. Upon landing in Wales, the publicity focused on the feat of the female pilot and largely ignored Bill's role. Fleming goes on to describe Earhart's rise to fame, her fashion business, her marriage to George Putman, and her record-breaking flights. The story continues to shift between life story and final flight until the two stories intersect. Not only will readers gain insight into Earhart's life, but they will also learn about the history of aviation and its impact on society. Black and white photographs, maps and newspaper clippings are interspersed effectively throughout the book. An extensive bibliography and source notes are located in the back of the book. When I picked up this book, I thought I already knew the story of Amelia Earhart. It turns out I only knew the legend. Fleming helped me see the real Amelia, a brave aviator and a brilliant self-promoter. *Looking for an exciting read aloud for middle grades? This would make an excellent nonfiction book to read aloud. I've always been fascinated with Amelia Earhart - even more so when I have just recently read Pam Munoz Ryan's Amelia and Eleanor Go For a Ride - strong women with a taste for adventure appeal to me greatly. I also love how you managed to kind of situate this book alongside all the other biographies written on Amelia - and the new things it has to offer. I shall check whether we have this in our libraries.